Electronics used to be just a bunch of humming beige boxes with blinking green lights. We’ve made a lot of progress in the last decade or so, and now electronics are mostly humming black boxes with blinking blue lights. 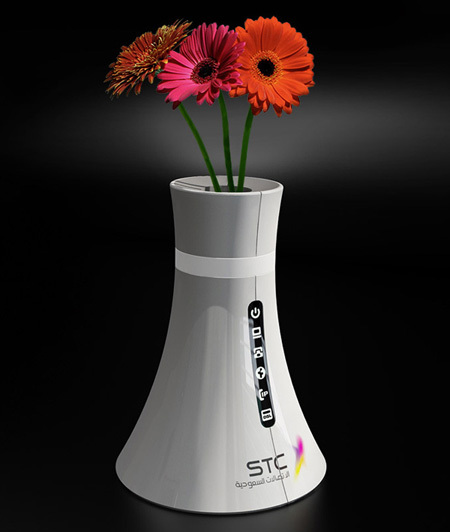 This vase router take a refreshing approach, forming a wireless router into a sort of nuclear power plant shape with space for a flower in the top. If it’s got space for water in there, I imagine you could fill it with soil and actually get something to grow, and the radiation from the router will undoubtedly cause all kinds of exciting and potentially horrific mutations. Like exploding petunias. Kaboom! Or, you could just set a vase on top of your existing router and try to grow something in that. Your call. The Power Plant Mini looks to be a full proof way to grow your own herbs all year round, whether you’ve never had much success with a garden, or simply don’t have room for one. All you need to do is plant your choice of seeds in the special ‘grow sponges’ and then make sure the water reservoir is filled with a mix of H20 and an included nutrient mix. The Power Plant Mini does need to be plugged in and placed near a sunny window, but after that it appears to be completely autonomous. All you have to do is sit back and wait for your crop of basil, cilantro (shudder), chives, parsley or whatever other ‘herbs’ you’d prefer to grow in the safety comfort of your own home. The Power Plant Mini is available on the Prepara website for a reasonable $39.95, while a 3-pack of grow sponges and a 1.6oz container of the nutrient refill are $9.95 each. Yes, I know, you’ve made blue roses before by sticking a white rose in some blue food coloring and waiting a day or two. Bully for you. But up until now, naturally blue roses have been an impossibility, for the simple reason that rose petals lack the enzyme necessary to produce the color blue. 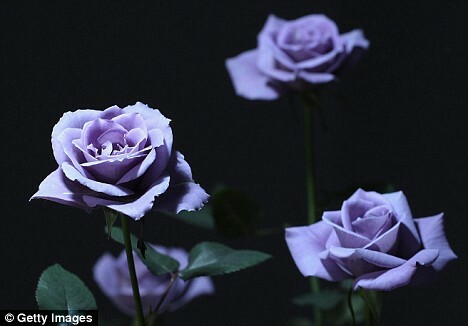 Naturally blue roses may still be an impossibility, but a little bit of clever genetic engineering has enabled researchers in Japan to stick some blue petunia enzymes into some naturally purple roses to end up with something actually blue. It’s got some blue in it, anyway. In the same way that yellow roses signify friendship and red roses signify love, blue roses signify the impossible, and I kinda think that still holds true, ’cause they look rather purple to me. You should be able to buy a more or less blue rose for that certain impossible someone early next year. Why is it that plants can grow just fine all by themselves outside, but as soon as you bring one indoors, it just gives up and dies no matter what you do? What do you WANT, Mr. Plant? HOW CAN I MAKE YOU HAPPY? Sigh. I used to think it was just me, but I guess there’s enough desperate plant killers out there to form a market for things like this plant Twitter kit. 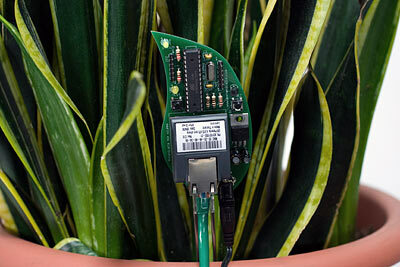 The kit consists of some moisture sensors and an ethernet adapter, which lets it update its own personal Twitter account with its current level of thirst. If the soil moisture drops too low, it will politely Twitter, “water me please.” If it goes unheeded, this is followed by “URGENT! Water me!” Turn the hose on it for a bit, and either rewarded as it Twitters “thank you for watering me” or chastised with “you over watered me.” This is much better than email, since friends and family can also subscribe to the Twitter feed and see how long the poor thing lasts in your inadequate care before Twittering “current moisture: 0%,” and it’s all over. The DIY kit (it needs a little soldering, but it’s a good excuse to teach yourself) costs $100 from Thinkgeek. By Jonathan Kimak on 10/07/08 • Leave a comment! 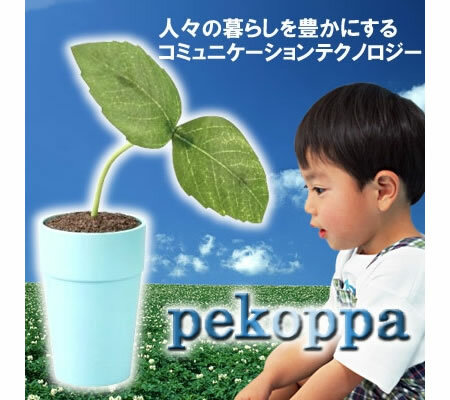 Sega toys has released an interesting “toy,” the robotic plant called Pekoppa. Pekoppa has a grand total of one feature, it nods when you speak to it. That’s it, just nodding. Maybe Sega has forgotten that for over a decade(probably two or three decades) there have been little dancing/singing plants with glasses on that also react to sound. Put on the radio and they’d go nuts, some even had their own music built in. So why would anyone ever want to get this? The ad says that the plant is there as a good listener. If you’re talking to a real plant I can accept that, maybe it even helps the plant grow, who knows. But if you are talking to a robotic plant, then it’s time to go out and find some friends.